This person on Twitter (her nickname there is thesophbot) has a rescued feral who needs a home. I don't know how else to get a hold of her except through Twitter. Can anyone help? Try posting it on PT, where there are more UK members. I hope she can find some help. That rescuer deserves a prize! Walking 3 miles in the snow to buy Metacam and doing everything in her power to help the pigeon, after the first vet's advice was to euthanise it... First class! The bird will need special care, as one of the legs was amputated. I hope someone will step forward and adopt him! Sorry I wasn't around to see this post. I've just checked and it was on PT but there was no final outcome posted although I noticed she was given some numbers to try. Have you seen any outcome on Twitter to know if she's sorted Teresa? Sorry, Janet, I'm not on Twitter. Tried enroling once but failed. I hope she found a new home for the pigeon. for some reason I thought you'd posted the original thread... just take no notice of me. I see it was Jen. Jen...what about sending her a tweet to reach her? Yes I did send her a tweet telling her to come to this forum. I've been working every day and didn't have much time to talk to her about it. I'll tweet her about pigeon talk too. I think we have a member in London that might take the bird. I realised after reading her post on PT that she was in the North of England and was obviously trying to get a home up there. Hopefully she will have some luck from the numbers she was given as unfortunately I'm way off. 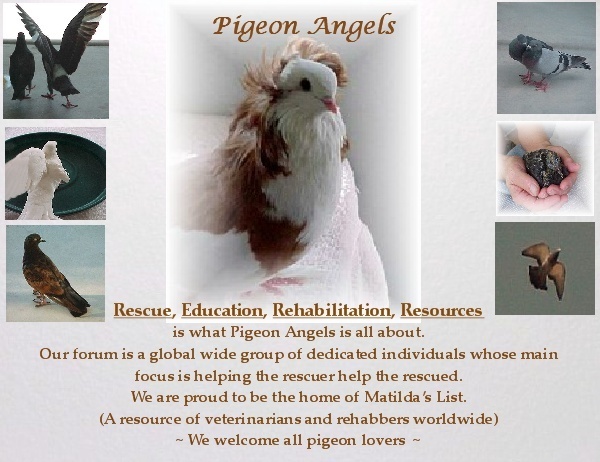 I also know someone who is desperate for a home for two pigeons in London, one is also an amputee and the other has lost an eye through being attacked. If there is a member on here that can help that would be so appreciated. I can't take any more now unless I can re-home two injured Woodies that have turned out to be unreleasable. Poor souls are currently living in my downstairs bathroom, it's seems impossible to find anywhere that will take them as they're a totally different ball game. They really need to be with other Woodies and so won't fit in my small set-up. I do hope this girl is lucky with finding her amputee a home. Janet...I'll send you the contact info. via pm. I hope some kind person will step up & give these pijjies a home. I just hate not being able to help in someway. Will send her an email. Hope you find a good home. Sad that there are so many out there that need placing. It is so sad that there are so many needing homes, or more so that there are so few homes. Rachel has kindly made contact in reply to my PM which was very kind of her. Not sure if she can help but maybe a possibility if she extends her aviary in the summer. Thanks for your input and good wishes. I'll keep looking. Wishing the best for these pijjies. Please keep us posted, Janet. Yes I certainly will keep you posted. Just wanted to let you know the one eyed pigeon has found a home. I think the rescuer was put in touch with a lady who has a blind pigeon and she's taken it in. Apparently the amputee she also had was released previously and lives well in a cared for flock. That one was caught and brought inside again as she had trouble foraging for food in the deep snow we had recently, but has been living free successfully for a while up to then. So that one will probably be released again when the weather improves and monitored within the flock. So for now that's good news. My Woodies have a possible home but not yet... I'll report on that when it's more definite. Thanks for the good wishes, they really helped. Thank you, Janet...that's good news. Glad he's found a home. That's great news. Really good outcome! Thanks for the good news.